Say what you want about the Greeks, they do two things really well – cheese and anarchy. I have always admired the Greeks for their ability to enjoy life, create amazing food and manage to plunge their country into widespread chaos at the flick of a switch. I last visited Greece in the 1990s, when the Drachma was its currency, an older Papandreou was PM and they weren’t beholden to Germany to pay their bills. I haven’t been back since, but I still remember the food – simply cooked, lots of lemon, olive oil and salty cheese – all served with their typical (sometimes dark) sense of humor. When my friend Nicholas, who runs fabulous events (you can read about his company here http://cocolatte.net ) offered to bring me some cheese from Cyprus, I jumped at the chance. Included in the cheese care package was some fabulous sheep milk feta. Feta is a crumbly aged cheese, used as a table cheese or in salads and apart from Zorba and Ouzo hangovers, is perhaps Greece’s best known export. Since 2002, feta has been the a protected designation of origin. Meaning that only cheeses produced in the mainland of Greece and from sheep’s milk (or from a mixture of sheep and goat’s milk), can call itself “feta”. Like all great ideas, I had planned to make Prawns Saganaki with the feta. Sadly, my lack of attention to my dwindling supplies, ruled this out. 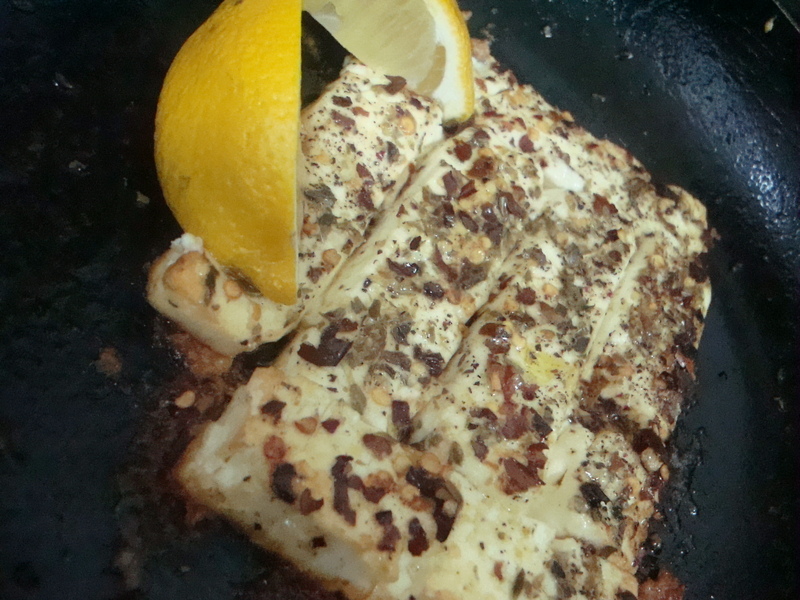 As did my lack of a saganaki pan – a small oven dish with handles. Saganaki, far from being a Japanese motorcycle, refers to a small pan used to serve a variety of dishes. I forged on regardless mainly because I had already worked out a name for this post – repurposing a pan the provenance of which is hazy. I doused the slices of feta with olive oil (after rinsing and patting them dry), sprinkled some red pepper flakes, oregano and ground pepper. I then popped them in the oven on 240 degrees for around 15 minutes. When out, I squeezed some fresh lemon juice and served with chopped fresh tomato and onion. Not the prettiest dish, but still tasty. So the outing didn’t end in (Greek) tragedy after all (yeah come on, I couldn’t resist that).